Who wakes up first – you or the kids? My middle child, Max (2). 5:45am. Every time. I am a real sleeper. I would sleep for days if I could. Early, punctual or eternally late for everything? Me - early. My husband - eternally late. What is your top tip for succeeding in business? Enjoying what you do. If you don’t, no one else will. What do you love most about your job? Setting my own goals. Managing my own time (badly). Answering to myself. What do you love least about your job? When you do your own thing, it’s impossible to switch off. I regularly dream about stock counts and cashflow analysis and end up answering random customer enquiries late into the night. People must think I’m mad! Favourite piece in your current collection? Everything is beautiful! Favourite thing you've bought recently? 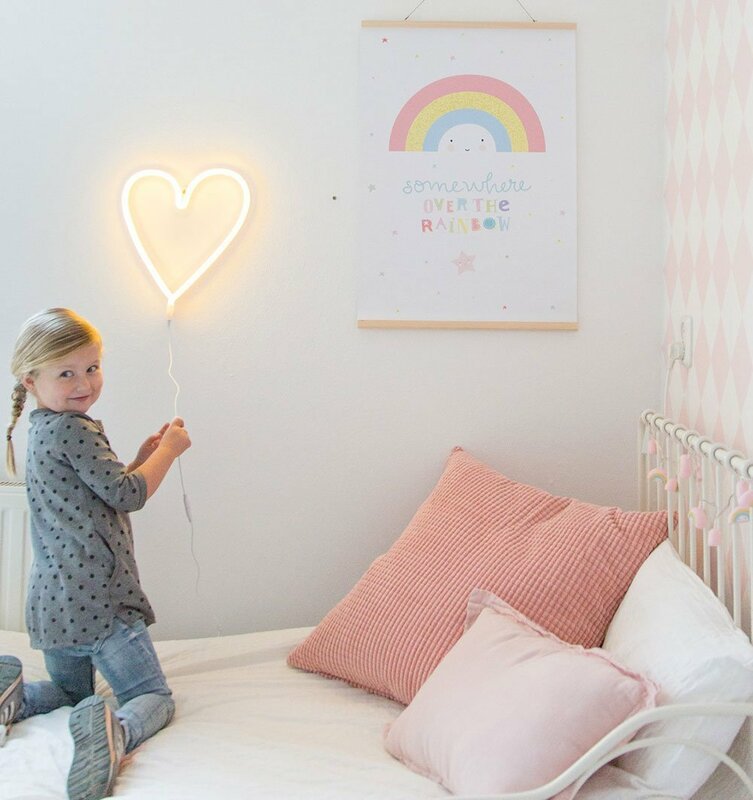 I just bought the A Little Lovely Company neon yellow heart light for my daughter. When you have time to indulge yourself what do you do? I recently had my first ever spray tan, which was a total luxury. Within minutes of getting home my 2 year old poured an entire glass of water over me and I looked in despair as my tan melted away… I had to wash the whole thing off there and then. Top holiday destination with kids? I love Corfu with my sister and her kids – clear waters, beaches, great food, buzzing about on little boats. Heaven. Go to quick, healthy recipe when time is short? Green pasta. Pasta with spinach sauce – whizzed steamed spinach and pasta. Tastes of nothing but they all love it! Favourite brands for your kids? Bonton have impeccable taste in all things little people. Top packing tips for holiday with kids? Despite packing everything but the kitchen sink, the children are invariably naked. Most spoiling baby shower present? A lot of cashmere for me and Dolly (my eldest). Nothing for the other two! Dream date night? Dinner around the corner at Riva and a lie in! Exercise – love or hate? Hate hate hate. Flat or heels? Flat all the way. I live in white plimsolls and white Reeboks. 3 ways you unwind? Tea. Jaffa cakes. KUWTK. Who wakes up first - you or the kids? Sadly me, I set my alarm. My youngest is normally awake bright and early but falls asleep for another little catnap just before 7! Early, punctual or eternally late for everything? Before I met my husband I was THE most punctual person but he’s forever running late and it’s rubbed off on me. It drives me mad! What do the My-Baba readers love most about your parenting and lifestyle magazine? We get lots of lovely e-mails from mothers reaching out and the one thing that seems to always come back is the fact that we are unbiased and never judge. As mothers I think we all do the best we can and don’t need any added pressure. We try to give sensible advice from professionals in their field wether it be fashion or fertility! What is your top tip for succeeding in business? God, I don’t know if you could say I’ve succeeded but I would definitely say, ‘keep at it’. If you want something and believe in it enough, dreams can come true. What do you love most about your job? I love and hate that I’m my own boss, it means that you never switch off but it does mean that you only have to ask yourself if you want to bunk off and watch the children playing matches or take them to the dr. You always find time for the important things. When you have time to indulge yourself what do you do? It’s pretty rare with 3 now but a massage, pilates or a bottle or red wine at home with my husband! I always find time for chocolate! Top 3 tips for a successful children’s party? I’m a copious list maker so I would say Organisation, fun ideas and an entertainer who’s brilliant with children. Most people know Sharky & George. I’ve used them for 10 years and they NEVER fail to get a child involved. I’m a sucker for a goody bag and they don’t need to cost the world, www.littlelulubel.com do mine for £4 each and they are pretty mega and www.dazzleandfizz.co.uk have also just launched the most dreamy ‘Party in a Box’. Go to healthy kids recipe when time is short and little bellies are rumbling? I’m totally obsessed with Lizzie Loves Healthy and her Immune Boost Pesto is delish and a bit of a go to at the moment and the kids love making her Sweet Potato and Spinach Bhajis, so easy! I always have frozen bananas on sticks in the freezer for a super easy pud, eaten solo or rolled in anything. Favourite day out in London with all 3 kids? So boring but it has to be https://www.chelseaphysicgarden.co.uk I love it there and then the https://www.nam.ac.uk the new soft play is great for my little one. Favourite brands for all 3 kids? Oooo that’s a hard one, can I have 3 for each?! Since having my first there has been an explosion of amazing brands. Mini Rodini, Scamp and Dude and Stella kids for fun, playful make you smile clothes. Bonton, La Coqueta and Rachel Riley for dreamy old fashioned and Zara, Gap and M&S for staples. Oh and Gucci just to drool over! Perfect baby shower gift? My mother in law gave me a Bamford Baby heart Onesie that I loved, my mother knitted me a gorgeous cashmere hat and blanket and my best friend have me a box of things just for me! Pj’s, Arnica, Juice, a great book, bed socks. All spot on! Dream date night? Steak and chips at home with my husband and a great movie or sushi with lots of Sake. Again with the husband!!!! Exercise - love it or hate it or both? Bit of both, I hate the idea of it but when I’m lying in the bath after a work out I always feel quite smug! After a long day top 3 ways to unwind? Bubble bath, corona then fall asleep to the Calm app wearing a Space Mask.